Clothes in Books does always love a fancy dress party in a book, and this is an excellent explanation of why. The book is somewhat reminiscent of Agatha Christie’s Cards on the Table, and none of the characters are particularly nice or attractive. The story starts in an academic setting, but isn’t really going to satisfy people looking for an academic mystery…. But it’s entertaining enough. And whatever went on at your New Year’s Eve party, you can be sure it wasn’t as awful as this one. There is a mention of the house detective at the hotel – long a feature of books (and perhaps of real life), it’s not something we hear of any more, and not a role it is easy to imagine in today’s hotels. We have seen Lord Peter Wimsey dressed as one perceptive commentator put it ‘in a harlequin onesie’, and there were charming pierrots here. For a fine selection of fancy dress entries, click on the label below. 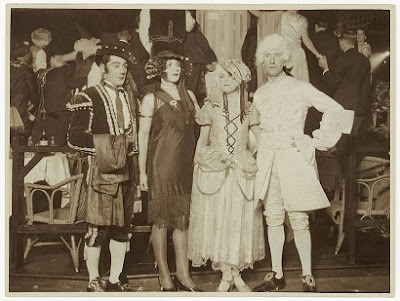 The picture of a fancy-dress ball is from Sam Hood’s collection at the State Library of New South Wales. The 2013 New Year’s Day entry featured Lord Peter Wimsey ringing church bells, not wearing anything fancy at all. Moira - There's something about New Year's and a fancy-dress party isn't there? This is a good match. I'll confess I've not read Masterman, but I completely understand your analogy to Christie. And I do like that flash of wit in the snippet you shared. I may have to put this on the list just for 'period piece' value. This sounds interesting, definitely worth a try. I like the idea of the New Year's Eve setting. Maybe for next year. Yes the book is funny because the parts preceding and following the Ball are quite straight and not terribly exciting, but the obviously really enjoyed writing the bits at the Ball. Moira: I loved the photo. It suits the story. The subject matter is so far from the New Year's of rural Western Canada. I have never even heard of a fancy dress New Year's ball in rural Saskatchewan. When Sharon and I went to New Year's dances there was no special dress. More recently it has become rare for there to even be New Year's dances. I don't think it happens much in the UK these days either! Is it called fancy dress in Canada? - before now I've come up against the fact that in the USA it would be a costume ball. Americans would take fancy dress to mean very dressed up, very formal dress I think. I think the hotel detectives must all have gone to the same golden age retirement home as the live-in secretaries and trusted family retainers. Oh yes Rich, and what a great setting for a murder story that would be. In one of the Agatha Christies there was a valet/masseur, he's probably gone there too. Nothing to trouble the embargo police here......thankfully. I do expect sterner tests along the way! Why doesn't that surprise me...?